Grammarly is a great grammar checker if English isn’t your first language or if you don’t write that frequently. It will help you check for grammar, misspelled words, spelling, typo errors, and punctuation mistakes quicker. Both the free and premium versions are beneficial for writers, students, bloggers who may have a lot of work they want to check. If English is your first language, then also Grammarly is the useful tool because it explains the finer details of English grammar. Grammarly acts as another line of defense, which you can use to make sure your post, report, book or article is accurate and easy to read. 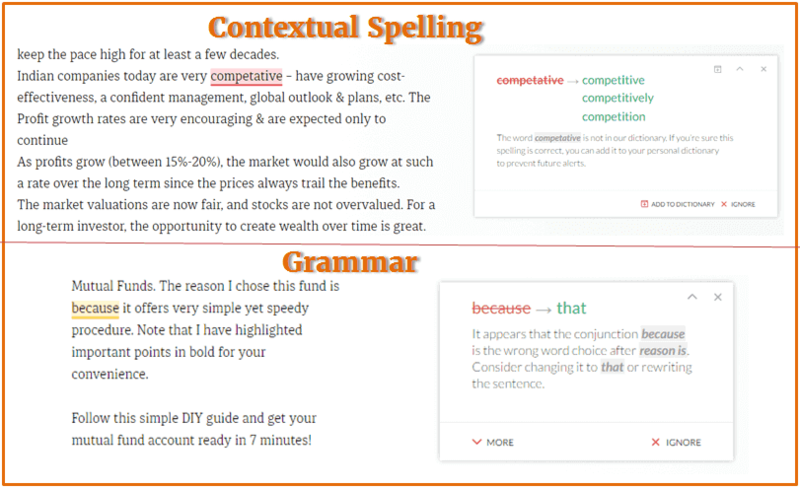 Grammarly has designed a superior grammar algorithm that checks content with over 250+ grammatical errors. It improves your English by suggesting the correct use of subject-verb, forms of the verb and much more that any another grammar checker tool does in the market. Why did I start using Grammarly? I started blogging very late because I was not confident about my writing skills, as most the people I am non-native English speaker/writer. Then somehow I decided to write myself for practice before launching the blog to gain more confidence. I took help from some of the tool available online like Grammar Check, Ginger Software, Reverso, Grammar Base and Sentence Checker tool for checking, some of them helped me in some or other ways in combination. 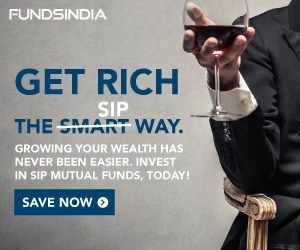 I launched my blog after three months of practicing and having the discussion with some experts. Then, recently I found Grammarly advertisement somewhere on the internet which caught my attention. 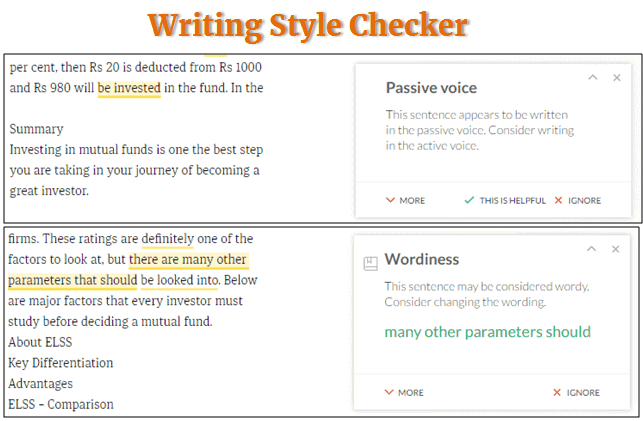 Immediately I decided to give it a try, and to my amaze, this turned out to be one of the best grammar checker tools I have ever used with very amazing features like plagiarism checker, synonymous, etc. SEO for readability was always red because I had many sentences written in the passive voice; SEO Yoast just gives the percentage of sentences that are in passive voice. After using Grammarly, I found out that I was using few words repeatedly and sentences in passive voice, these were two errors I was repeatedly making. So now that I got my improvement area, I always concentrate on these points and most of my mistakes are minimized. To use Grammarly, you must first need to register for a free account with them. The best thing about Grammarly is that its basic free plan is entirely free and offers many features. You can download the browser extension, Online Editor, or Use Microsoft Plugins. Once you create and verify your account, you can use Grammarly in 4 different ways both for Free as well as Premium account. Here is the detailed explanation of the main features offered by Grammarly for the free account. The most common difficulty faced by most of the writers is spelling mistakes. The principal function of Grammarly is spelling checking tool. It is very helpful spelling checker tool that can help you if your writing skills are not that good. Grammarly analyses all the spelling mistakes and correctly spelled words used in the wrong context, such as the incorrect use of lose/loose, affect/effect, there/their/they’re and many others. Grammarly is the world’s best online grammar service regarding quick and intelligent spelling check. Grammarly scans the full page and indicates the wrong words by suggesting the possible corrections. You can fix the incorrect word just by clicking the underlining word, and a pop-up will appear with possible correct words. As shown above, I intentionally misspelled “compatative “ word; Grammarly has immediately suggested correct spelling and few more right words also. This feature does not only highlight the part with the error but also recommends you a proper replacement for the part of that sentence. Grammarly checks text for the subject-verb agreement, misused articles, consistent verb forms and tenses and lot of other grammar rules. As we have learned in our school days, that correct grammar is very vital for each language. It can quickly show grammatical errors by checking its database consisting of several hundred of rules. The best part of the tool is that not only does it highlight the part with the error but also recommends you a proper replacement for the part of the sentence. When I first started writing my blog posts, I often ended up giving commas at wrong places. Giving punctuation marks at proper position gives a professional look to your writing. Grammarly helps you in giving punctuation marks at the perfect place. As shown in above image, Grammarly quickly detects missing and unnecessary commas. Giving punctuation marks may not be important for a regular blogger, but it is crucial for a student who writes reports and essays and submit projects to their teachers for evaluation. Almost all non-native English speakers often have trouble in forming a sentence in a correct way. Grammarly addresses this issue as well. I had great help from this functionality. 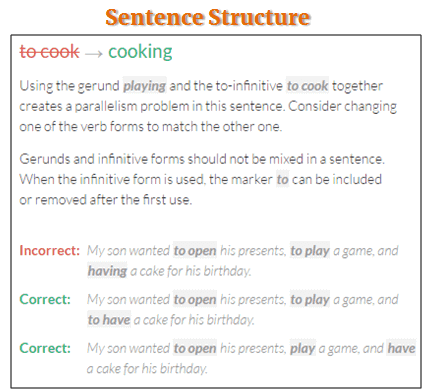 This feature checks the sentences for missing words, misplaced words and incorrectly framed sentences. This feature makes it easy for the people who have recently started to learn English to write in English like a pro. This feature also checks the article for any errors in the writing style which includes the use of passive voices and helps to evade repetition and wordiness. Apart from the errors detected with Free Grammarly Account (150+ checks), the Premium version checks for additional 100+ advanced grammatical errors. Let’s see each advanced feature in details here. Writing in English for a non-native English speaker is always a task if you do not have a good vocabulary. But, Grammarly has made it simpler for me with its Vocabulary Enhancement feature. What this feature does it scan the article and find the words that are repeated many times. It will then suggest another word with the similar meaning. You can substitute these words with the Grammarly suggested words. To enable Vocabulary Enhancement feature, you must have a premium account then you can enable that from the left-hand sidebar. Here comes the astonishing feature of Grammarly called plagiarism detection. Plagiarism checker checks the article for any grammatical errors, but it also checks more than 8 million web pages to detect if the article has been copied from somewhere else. If you are a preparing a report and want to publish it on the internet, it is critical that you should check that its content is not copied it from the internet. If the article has been copied, it also provides you with the link to the original website so that you can evaluate it yourself. As you can see in the screenshot above, it shows that the article is 95% unoriginal because I have copied it from my blog only. Grammarly Review: How to Use Grammarly? There are several ways to use Grammarly to keep a check on your content. If you do a lot of writing online, then you can install an extension on your internet browser. Modern browsers like Chrome and Firefox are supported to use this functionality. Grammarly will automatically check for errors whenever you write a post, mail, or when you post on Facebook or Twitter. 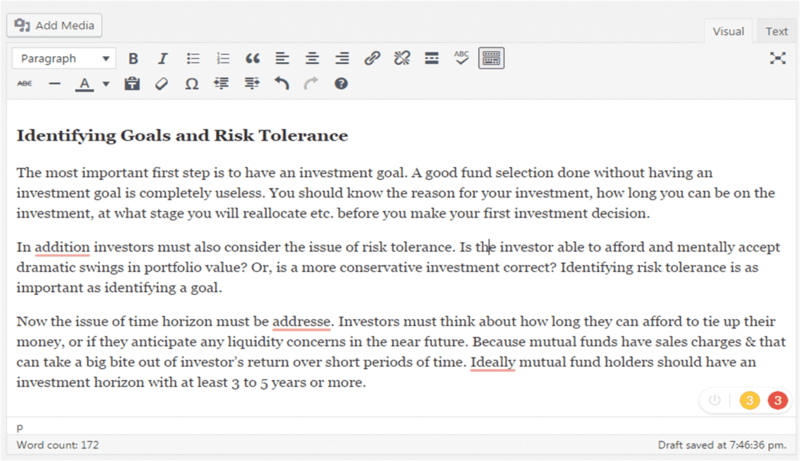 Online Editor is another way from which you can check your content for mistakes. You can quickly paste your content and then check for any errors, fix them and copy it back to your files. If you work a lot in Microsoft Word or Outlook, then you have a separate extension specially designed for Microsoft products. You can quickly setup Grammarly by installing a software which you can easily download from Grammarly website. See more details in next few paragraphs. Lastly, you also have the option to install a standalone application to your computer. Now let’s see each platform in depth. If you are using the basic free plan of the Grammarly application, you will be able to download and install the browser extensions (available for Chrome, Firefox, and Safari) so you can work with it. Grammarly makes writing much easier by providing the various web browsers extension. By enabling browser extension, you don’t need to copy-paste text in the online editor because it checks text we write anything within the internet browser. No matter you’re a professional, student, blogger or writer, you can correct grammatical and spelling mistakes anywhere on the website. As of today, the extension is only available for Firefox, Chrome, and Safari. I highly prefer installing the extension to take maximum out of it. Once you install this extension, Grammarly will check your grammar, word meaning, synonyms, spelling, and punctuation marks as you type on almost every website including Facebook, Twitter, Gmail, Yahoo, LinkedIn, WordPress, etc. just by double clicking on it. Let’s take an example to see how this browser extension works. I have given an example of Facebook and Twitter. 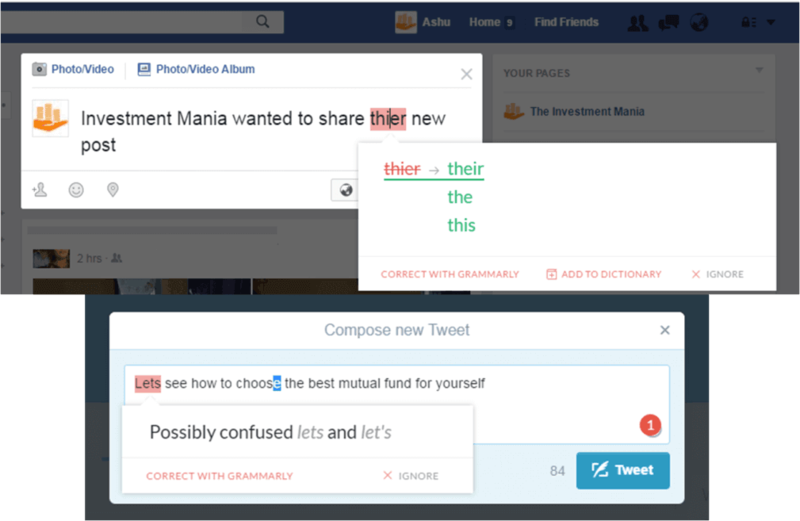 In the first picture, I wanted to write “their, ” but I misspelled it as “thier,” now as you can see Grammarly has suggested new words to me those might be right. Similarly, I wanted to write “let’s,” but I misspelled it as “lets,” here also Grammarly has given a suggestion as “Possibly confused lets and let’s.” Here you just need to click on “CORRECT WITH GRAMMARLY” to launch advanced lightbox interface. 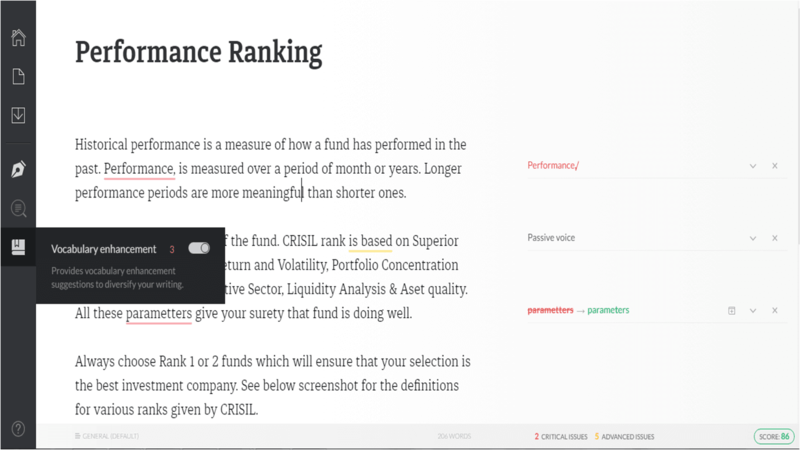 When you hover over that number, you will see a slide-in showing you the critical issues and advanced issues simultaneously that need to be corrected. If you don’t see any errors, then you have no grammatical errors in your content. If, yes you see something like this, then click on the “CORRECT” button and a pop-up (lightbox) will open in your browser. As shown in above image, your complete content is present on the left side with the errors underlined, and the correct solutions are on the right. One amazing thing about Grammarly is that it doesn’t just rectify your grammar errors like spelling or punctuation blunders but also shows you if you have used passive voice in any sentences. Now all you have to do is just click on the right words on the right side, and the errors will be replaced with the correct suggestion. Whether you edit along the way or not, you want to run a final check of a Facebook post, blog post or article before launching it. Use the lightbox interface before you click “publish” on your post. Grammarly’s Online editor is one of the easiest to use ways for addressing spelling, punctuation, vocabulary, plagiarism and all other 250+ English rules. You copy and paste in your text in the new file and then wait a few seconds while the Grammarly engine examines your document. You correct all the changes you desire from the list of recommendations, with just the click of a mouse. Once you are satisfied with your corrections, you can copy and paste from Grammarly back to your preferred document editor tool. The below image showed some errors when I copy-pasted some paragraphs in the editor. Now you simply need to click on the right words on the right-hand side and they will replace the errors. By following the above steps, you will make sure that your content is error-free by proofreading it with this excellent grammar and spelling checker tool. Grammarly maintains much of the original formatting of the file, but advanced changes might lose. If you have parts of your document centered or bolded, that will get lost when you copy and paste the content. Formatting may be a problem with the notepad rather than Grammarly, but it can be annoying. It’s much better to finish all of your editings before you start formatting your document. You can also upload documents in the Word format as long as they are small enough to handle. Further, You can access your contents from anywhere in the world by saving it in the online editor. Download the Add-In setup (Apps) file on your computer and install it like you install any other software. You can enable Grammarly for both Microsoft Word and Outlook if you can select or deselect these two options. You will be required to give your login credentials during the setup procedure. Now open Microsoft Word or Microsoft Outlook, and you will see Grammarly option in the top Menu bar. The next step is to enable the Grammarly feature in your Word or Outlook document, and it will start showing you all the spelling errors, grammatical errors, punctuation mistakes, etc. There are two issues with this app, so be careful with these two functionalities. Undo function (Ctrl +Z) is disabled. Grammarly is not leaving any stone unturned; they also have the application which works similar to the online editor. 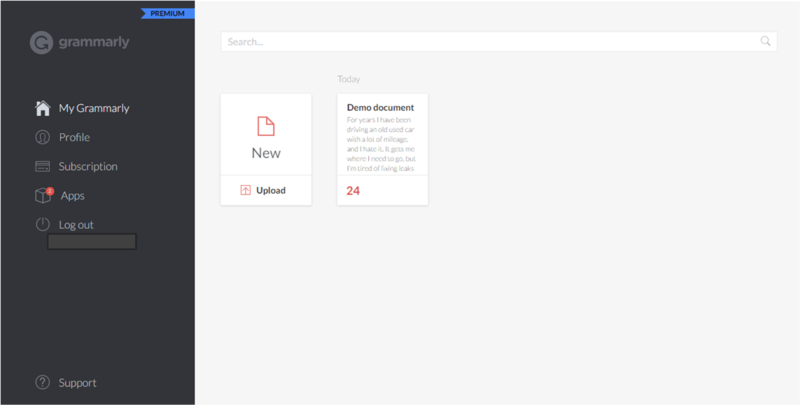 You can easily just drag and drop files to proofread into Grammarly. Also by installing the application on your computer, Automatic updates ensure you always have the latest version. As I said above, now I am regularly using Grammarly for checking my posts and emails. As you might have observed, my writing skills are improved a lot since last three months. 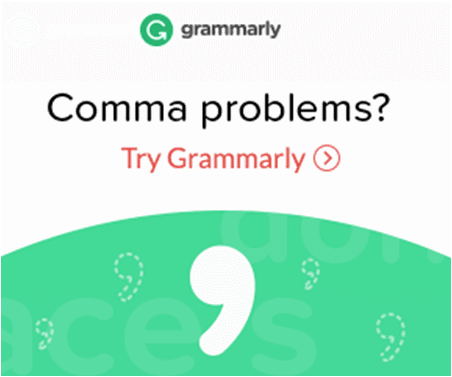 I gained good knowledge on various grammar checks as Grammarly gives you an explanation of each error, which helps you get great understanding. Though you feel you are great in English, this tool makes you used to it with its great features. It’s almost perfect, but in some cases, you need to watch out for things such if you are using a repetitive word, Grammarly may suggest you another word to use, in this case, you need to make sure that you should choose it at best suitable place. See below case where I have used HUGE word repetitively, in descending order, but Grammarly has suggested me similar word for the last word which is less in percentage. As with every other tool, this tool also has some drawbacks or limitations which should you know to use it in a better way. Easy to use online with any website including WordPress, Gmail, Facebook, Twitter and much more. 100 times better than Microsoft spelling and grammar checker. Plagiarism Checker is perfect for bloggers, students, and writers. Works on almost all platforms across the world like website app, computer program, and Microsoft products. Bit expensive at $29.95 per month. The annual plan is affordable at $139.95 per year. You must be online to access and take benefits of Grammarly. Grammarly is best, but you shouldn’t use Grammarly to correct all suggestions to score 100. Otherwise, you may lose the meaning of your work. Sometimes if you ignore some suggestions then also same recommendations are repeatedly shown. Sometimes when you don’t want to implement ideas, and if you ignore them, Grammarly still shows them as the error. Grammarly doesn’t have the mobile app yet. It will be a very comfortable world if we have this on the mobile app. Grammarly is unquestionably the best online grammar checking tool around the world. It detects and suggests corrections for almost all the spelling errors, typo errors, punctuation marks, and grammatical errors. A must have tool for all who deal with the English language. The premium version gives the two best features named as “Vocabulary Enhancement” and “Plagiarism Checker.” These are the unique features of Grammarly which are hard to get in a single package anywhere. I highly recommend using Grammarly as a final defense line when you post anything online, submit your reports or write emails as human eyes often ignore the mistakes. The best part of the Grammarly is it just doesn’t fix errors but also gives you an explanation how it is wrong, why it is wrong and how to correct it. Use it, and you will love it. Let me know your thoughts on it. Grammarly is just awesome….Had never thought such tool exists….thanks a lot for sharing this review. A perfect gift for new year ☺..
Hey Navin, thanks…Happy that you found Grammarly useful..Keep learning! Looks very good. Going to try on my international paper..thank you for sharing your views. Hey Suban, Happy to help you. Grammarly corrected my 14 errors, I am surprised to see that Default spelling checker of word didnt gave me error at those 14 places. In free version I could not use plagiarism checker. Monthly plan is very costly, so I used another free online tool for this purpose.. Overall the free version is best than any other online tool. Once again thank you. Hey Suban, as I said in my post-Grammarly corrects more than 10 times the default word spelling checker. Yes, their monthly plan is bit costly. If you are a writer or write many papers a year, you can try the yearly plan which may be cheap for you. There are many online free plagiarism checker that you can go for temporary work but they are not that great compared to grammarly. You can check plagiarism for each sentence and word, which is best part of the grammarly. Grammarly made my day! Very happy to discover this post and review.. I wish they could have mobile app too for android. Hey Vijay, good that you find this helpful. I too write many articles on my mobile and definitely wish to have their mobile app. Currently, they do not have app for Grammarly, but considering their efforts to bring out every possible way to have good user experience, we hope that they launch mobile app soon. Yes, Grammarly is a great tool. I have been using its free plan from last one month and it helps to a great extent. A must use tool for everyone. Outlook extension works very well for me. Grammarly helps me a lot while writing emails to my clients. 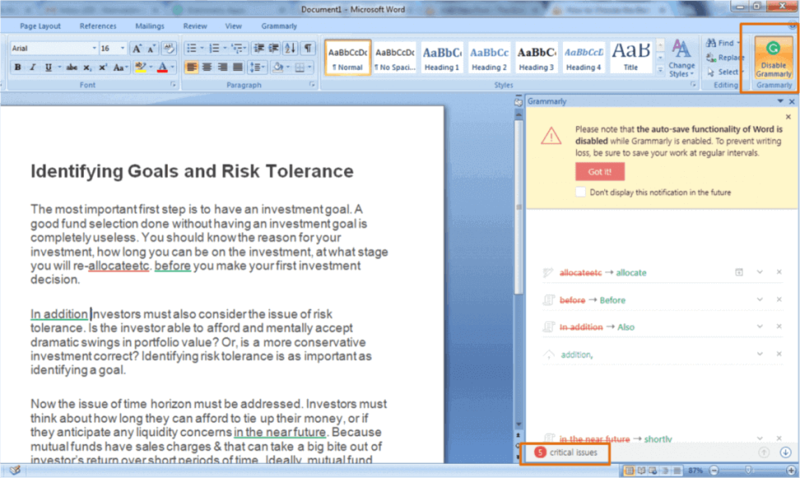 However word extension is bit slower, so I have to use Outlook while writing reports. Referred another friend and got 1 week premium version free. This is absolutely best tool. Great..Hope that it was useful to you..
Grammarly made my day. Thanks a lot. 1 disadvantage is that i can not use it on quora. So i have to copy my answer to Grammarly. Othrrwise this tool is the Best. Best tool…shared with my students. © 2019 The Investment Mania.